Your contest list is on of the things I look forward to most about the day being Tuesday. Thanks for the effort and links. You've rocked out another fabulous list! Thank you for your time in this. hOLA AMIGA, PUEDES ANOTARME EN TU REGALO, ESTABA CONVENCIDA QUE LO HABIA HECHO , SI HASTA TENGO TU BOTON EN MI BLOG!!!! QUIZA LO PUSE Y OLVIDE ANOTARME???? Another great list - thank you! Yay! 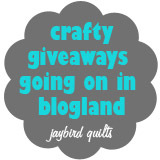 Thanks for posting about my giveaway Julie - you rock! I'm hosting a giveaway on my blog until April 30th for a set of 4 quilted coasters made of vintage fabric. Big giveaway week at my new blog http://vintagesheets.blogspot.com.. 8 days of giveaways.. enter until the 29th!